South Korean tech giants are competitively filing patents related to foldable panels in a move to make a breakthrough in the smartphone industry slowed down by limits of hardware innovation. Over the last six years, a total of 276 patents related to foldable panels were applied for in Korea, with 210 patents filed in the last three years, according to the Korean Intellectual Property Office on Sunday. LG Display has applied for the highest number of patents (94), followed by its rival Samsung Display (80), Samsung Electronics (23) and LG Electronics (17) over the last six years, the nation’s intellectual property agency said. 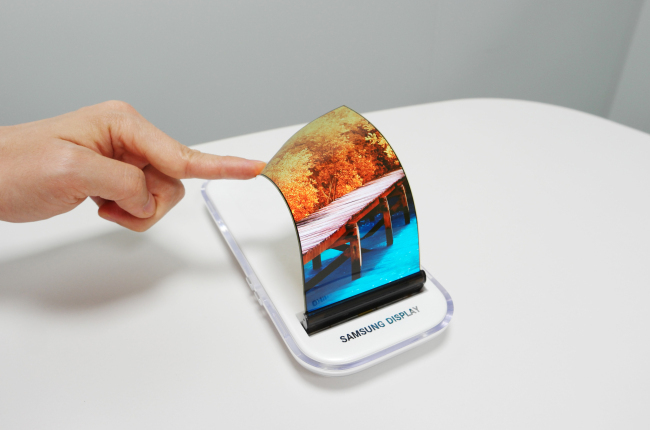 Foldable displays are seen as a new technology breakthrough among global smartphone giants with differentiated features to allow a device to be used as an ordinary smartphone in the folded mode and as a tablet when unfolded. Apple is also rumored to unveil its first foldable phone in 2020 in partnership with LG Display. Other Chinese handset makers, Huawei, Oppo and Xiaomi, are also developing their own foldable devices with the aim of launching them soon. The key of foldable smartphones is to make technologies that can withstand tens of thousands of bending, folding and unfolding. Most patents applied by the Korean tech giants are thus related to the durability of the foldable panels. The largest number of patents applied in Korea was hinge and housing technologies (86), followed by technologies to restore panels after unfolding (50), sensing users’ touch when folded (48) and cover window (22), according to KIPO. “Foldable smartphones are expected to give a boost to the stagnant smartphone market with completely different designs and innovative technologies,” said Kim Jong-chan, chief of KIPO’s display device screening division. “As durability is the key to commercialize foldable phones, a tech company that secures related technology patents will have an edge over its rivals,” he said.